Found one file extension association related to Ports Of Call and 1 file format developed specifically for use with Ports Of Call. 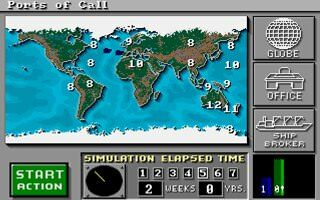 Ports of Call is a trade and ship simulation computer game with history starting on old Amiga. After so many years POC (more than 20 since the first Amiga Version in 1986) is still very popular and we decided to develop a new generation of this game, with new technical features as 3d simulation and new features with more ships and harbours, multi freights and many more for the trading part. The new POC Called POC XXL will constist of two parts, The trade part(called POC XXL) and the optional simulation part (POC Sim3d). POC XXL will call POC Sim3d when a simulation is wished. Also a 2d simulator is contained in POC XXL. But POC Sim3d can also be played as a standalone game. If you need more information please contact the developers of Ports Of Call (Rolf-Dieter Klein), or check out their product website.